What is blood pressure? Blood pressure, also called hypertension, is the force of blood pushing against the walls of the arteries. What is a blood pressure reading? Your blood pressure reading is expressed with two numbers — for example, 120/75. The first number, known as systolic blood pressure, is a measurement of the force your blood exerts on blood vessel walls as your heart pumps. The second number, known as diastolic blood pressure, is a measurement of the force that blood exerts on blood vessel walls when the heart is at rest between beats. What is high blood pressure? High blood pressure means the heart is pumping harder to move blood through the body. This can weaken blood vessels and damage major organs, such as the brain. Left untreated, high blood pressure can lead to stroke. Controllable Risk factors -Blood Pressure can be easy to monitor and control. Blood pressure, like a person’s heart rate, will vary occasionally with exercise or stress. For people over age 18, an optimal blood pressure reading is considered 120/75 or lower. A blood pressure reading consistently higher than 120/75 is considered “pre-hypertension.” High blood pressure or “stage one hypertension” is a measurement of 140/90 or higher. People who have high blood pressure have more than half the lifetime risk of having stroke compared to those who consistently have optimal blood pressure of 120/75. Anyone who has had a previous heart attack, stroke, is diabetic, has kidney disease, high cholesterol or is overweight should speak with a doctor about aggressively controlling and lowering blood pressure. Maintaining a blood pressure reading below 140/90 may reduce the risk of further complications. Who has high blood pressure? As many as 75% of Adult New Zealanders have high blood pressure. Of the 1 in every 5 adults with high blood pressure, 31.6 percent are not aware they have it. How is high blood pressure related to stroke?Doctors have long called high blood pressure “the silent killer” because a person can have high blood pressure and never have any symptoms. If left untreated, high blood pressure can lead to life-threatening medical problems such as stroke, heart attack or kidney failure. High blood pressure is one of the most common causes of stroke because it puts unnecessary stress on blood vessel walls, causing them to thicken and deteriorate, which can eventually lead to a stroke. It can also speed up several common forms of heart disease. When blood vessel walls thicken with increased blood pressure, cholesterol or other fat-like substances may break off of artery walls and block a brain artery. In other instances, the increased stress can weaken blood vessel walls, leading to a vessel breakage and a brain hemorrhage. If a person has had a stroke, it is especially important to keep blood pressure controlled to reduce the risk of recurrent stroke. Age: The incidence of high blood pressure rises in men after age 35 and in women after age 45. Gender: Men are more likely to have high blood pressure than women until age 45. From ages 45 to 64, men and women have similar risk. After that, women are more likely to have high blood pressure. Race: Approximately 41 percent of Maori, Polynesian or Samoan’s have high blood pressure, compared to 28 percent of Caucasians. Nearly half about 44% of Maori women have high blood pressure. Samoan have a slightly higher risk for high blood pressure than Caucasians. Other factors that can lead to high blood pressure include excess weight, excessive alcohol consumption, diabetes, lack of exercise and a high-salt diet. 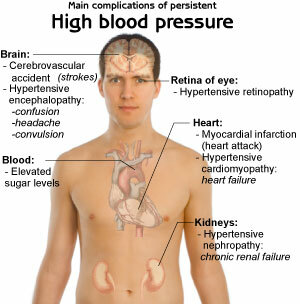 How can high blood pressure be treated? In most people, high blood pressure can be controlled through diet, exercise, medication or a combination of all three. A diet that is low in salt and rich in vegetables, fruits and low-fat dairy products may help lower blood pressure. Recent studies have also shown that increasing potassium intake, (for example, eating fresh fruits and vegetables), may help lower blood pressure. A program of regular exercise — appropriate to a person’s age and fitness level, and approved by a doctor — may not only aid in weight loss, but also help to lower blood pressure. Finally, a wide range of medications is available to treat high blood pressure. A doctor may have to try several different drugs before you find one that works best for a person’s needs. This is common problem that doctors are used to handling. It is important to take any medications exactly as prescribed, even when a person feels fine. There are a vast number of prescription antihypertensive drugs on the market from which to choose. In many patients, some antihypertensive drugs may cause side effects such as dizziness or nausea. Doctors can work with patients to select the best antihypertensive for their medical profile and lifestyle. Various antihypertensive drugs work differently some decrease the volume of plasma in the blood or slow the rate of blood flow through the body, while others relax the heart by affecting the passage of certain elements in the blood. Factors to consider in the selection of antihypertensive drugs include cost, convenience, side effects and interaction with other drugs. Where can I get more information on high blood pressure? Speak with a doctor about how to control high blood pressure. The key to keeping blood pressure within the normal range is for a person to commit to being an active participant in their healthcare with a doctor.